Cospa best! ! I would like to report the life span after using it. This review is about item#2126607. We are using it during machine maintenance. It is relatively inexpensive in price, good quality and handy. It is easy to cut and easy to use. This review is about item#2126661. I am using it without problems. I am saved when the price is a little cheaper. This review is about item#2126625. There is no problem in durability at all. If it is an oil resistant hose, years have become harder and it caused fuel leakage and I was in trouble. This is wonderful. This review is about item#2126634. Oil-resistant, gasoline-resistant products of this size are not in the neighborhood home center order I was saved because there was much usage. I think that it is a good deals and good products. Easy to use with a durable tube. I wish the price was a bit cheaper. This review is about item#02126625. Until now, I bought it by mass selling at a home center, but I purchased it because the number of meters is as small as 20 m. There was no problem in terms of material. This review is about item#2126643. It was used for replacing the piping of the intensive lubrication device of the combine. This review is about item#2126652. It was used for the expansion of the reserve fuel tank for the generator of the camper. Although we added a fuel tank for the generator of the camper car, we used a considerable length, but we are using it without bending. I think that it is unused, but there is no oil resistance problem. In the future, we will verify the contraction status of the hose. The price is cheaper than the nearby home center, so I decided to purchase it here. Although the item has not arrived yet, I think that it is the same as what I use here, it is five star rating. This review is about item#02126643. 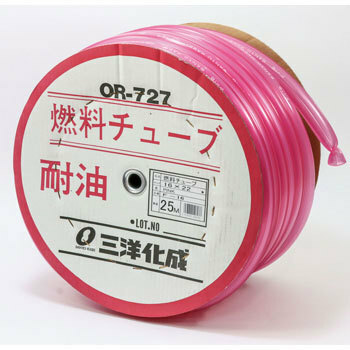 Because the genuine rubber pipe easily deteriorates with heat, the condition is good as it is exchanged. However, because it cured by heat, flexibility disappeared, replacement was necessary. This review is about item#02126616. It is cheaper than the place you purchased before. Since I just started using it, I can not evaluate it yet, but it is easier to use than other tubes. This review is about item#03346725. Durability is questioned, so I do not know yet. This review is about item#02126661.